America’s cats are facing a healthcare crisis. The findings of a feline health study conducted by Bayer Health Care found that 52% of America’s 74 million cats are not receiving regular veterinary care. The actual number is probably much higher, since this study only captured data from cat guardians who do seek some veterinary care, not those who never take their cat to the vet. The study also showed that cat guardians are not willing to spend as much money on healthcare for their feline charges as dog guardians. Ironically, while spending on veterinary care is declining, spending on pet products is increasing steadily each year. There are two problems with declining veterinary visits for cats. One is the perception among many cat guardians that cats are self-sufficient. And while cats may be more independent than dogs, they’re also masters at hiding signs of illness, which is why regular veterinary exams are so important. By the time a cat shows symptoms, the disease may already be in the advanced stages, requiring more extensive, and expensive, care. The second problem is that taking a cat to the vet is stressful for most cats and their guardians. The Cat-Friendly Practice Initiative hopes to remove the barriers that prevent cats from getting the care they need. All cats should get annual exams, and cats seven or older should be seen by a veterinarian twice a year. Clinics enrolled in the program receive training and support from the AAFP that will lead to a better understanding of cats and their unique needs at the veterinary clinic. The biggest obstacle to getting cats into the veterinary clinic is the stress associated with even just the idea of a vet visit. From getting the cat into the carrier to the stressful car ride to being in a place that is unfamiliar and scary for the cat, it’s enough to make a cat guardian throw up their hands and say “forget it!” However, none of these challenges are insurmountable. Educating cat guardians on how to train cats to accept the carrier and the car ride is crucial. Additionally ,cat guardians need to understand that it’s often their stress who makes a vet visit even more challenging than it needs to be. Cats are sensitive creatures and they will pick up on their guardian’s energy. Clinics are encouraged to have separate cat and dog waiting areas. Taking the cat into an exam room as soon as she arrives at the clinic, rather than having to spend time in a waiting room where she may see or smell other cats, helps keep cats calmer. Proper handling of cats is crucial. Cats should never be dragged or dumped out of carriers. Veterinarians prefer carriers that can be disassembled, or have openings on both the front, side and tops. These types of carriers will often allow the entire exam to be performed while the cat remains in the carrier. Gone are the days of heavy restraint. Less is more when it comes to handling cats. Gentle handling is critical, especially for older cats. Veterinarians and staff who work with cats need to learn to manage their own energy. There should be no raised voices in the clinic, and interactions with cats should be guided by calm demeanor and slow movements. Perception is important for veterinary staff, as well. If staff assumes that cats are going to be hard to handle, they won’t be able to approach them in a relaxed manner. For that reason, Dr. Marcus Brown, the current president of the AAFP and owner of Nova Cat Clinic in Arlington, VA, does not allow the word “fractious” to be used in his practice. The sequence of how an exam is performed can make the difference between a pleasant visit and a stressful debacle. Dr. Elizabeth Colleran, who owns two cat hospitals, Chico Hospital for Cats in Chico, CA and Cat Hospital of Portland in Portland, OR, leaves taking a cat’s temperature for last. She also doesn’t recommend that a technician goes into the exam room first. “Cats will be impossible to touch if a technician takes their temperature before the doctor even comes into the room,” says Colleran. She prefers talking to the cat’s guardian first and getting a complete history while the cat has a chance to acclimate to the strange environment before the actual physical exam even starts. Hospitalized cats require different arrangements than dogs. Ideally, they will be housed in a separate ward. They will need places to hide within the cage so they can feel safe. The benefits of hospitalizing a cat will always need to be weighed against the stress of the experience. A feline-only practice will often be the optimal solution for cat guardians, but even though there are more and more of them, they still aren’t widely available. Looking for a certified cat friendly practice can now present another option. Certification requires a practice to have at least one staff member who belongs to the American Association of Feline Practitioners. Practices will receive training and must comply with a 10-item checklist. If approved, the clinic earns the “Cat Friendly Practice” designation and is listed in the “Cat Friendly Practice” online database. For more information about the initiative, please visit The Cat Friendly Practice. 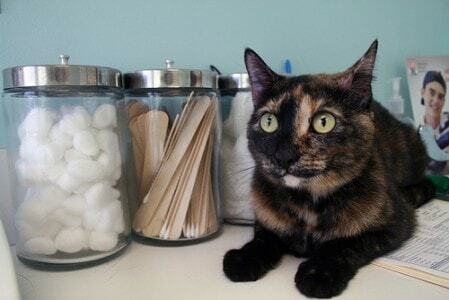 Is your veterinary hospital cat friendly? What do they do that makes it easier for your cat to visit? I am very hesitant to post here because nobody really wants to hear what I have to say about it, but lets face it, about six years ago the U.S. economy went in the tank and hasn’t recovered yet. Many millions of cat owners find themselves in the situation these days of having less discretionary funds available for things like vet care. Unfortunately, just about the time that people had less money to spend on vet care for their animals, the cost to see a vet was going up significantly. Vet hospitals are getting bigger and fancier with more staff, and this all costs more money. I am retired on a fixed income, and I know that I have less to spend on vet care for my kitties. Does that mean that I should not have them?? I try to save a bit out of the food budget, etc. so that I can have the funds to pay down my Care Credit bill when it comes. I have heard all the reasons/excuses why we have to pay more and more for vet care, but the fact remains that there is a real disconnect between what the providers charge and the ability of the customer to pay! And, Econ 101 tells you that if there are fewer consumers of a service those that do pay for it will have to keep paying more and more… right? As a former veterinary hospital manager, I can tell you that nobody in the veterinary profession is getting rich from the service they provide. They face rising costs just like all of us do. I do, however, appreciate the challenges people face when faced with these rising costs, and I sure wish I had answers! Pet insurance may be one answer, although it remains to be seen whether it will have the same effect on veterinary health care costs as insurance has had on the human side. 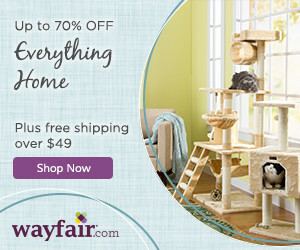 They use Feliway diffusers in all of the rooms and have incredibly gentle and compassionate staff. I also use Stress Stopper with Katie for all of her vet visits. …thanks to you! We have our favorite vet at the clinic, but have seen many of them and they are all fantastic. Now that I know how terrific they can be, my advice would be to shop around until you find one that you love. It sounds like your vet is extremely cat-friendly, Debbie. And I’m so glad the Stress Stopper is working for Katie. It’s such a great product. It is true that feline-only practices tend to be a little more expensive than “mixed” practices, Julie, but I don’t think that factors into the issue of declining cat visits. we are “lucky” in that our vet comes to the house. that being said, there are some that still get stressed. and had to laugh at “fractious” as Mo is just BAD! but it is sad that so many people don’t get cats seen on a regular basis. mom says our healthcare is better than hers. House calls can be a great option for many cats, but as you said, it can still be stressful. After all, cats are extremely territorial, and with a house call, a complete stranger not only comes into their space, but does undesirable things to them! I love that even a feline only practice is still going through the certification.